I’m old enough to remember when pesto genovese, the Genoese basil sauce, was a novelty in the US. These days everyone knows about pesto, to the point where it’s become a stand-by, especially in the summer when fresh basil is everywhere. Truth be told, though, as common as it is, pesto is rarely well made in this country. Too many versions you’ll come across, including anything you might buy in a jar, are timid imitations of the real thing. While a truly authentic ‘DOC‘ pesto genovese is virtually impossible to achieve outside Liguria (more on that later), you can make a very tasty imitation if you follow a few simple tips. The first thing to know about pesto—and I have this from a Genovese friend—is that it should be both fragrant of basil and redolent of garlic. And one shouldn’t skimp on grated cheese and seasoning. When you’re done, the flavors should veritably explode in your mouth. In the age of food processors, pesto is simplicity itself to make. You throw in the garlic cloves and pulse a few times, until the garlic is minced fairly well. Then add the basil, a handful of pinoli, salt and a generous amount of olive oil. Whiz that around (always using the pulse button) until you have a rough paste. Don’t over-process. Pesto should have texture, with each element still perceptible to the eye and tongue. Then add the grated cheeses. Pulse again, just enough to blend the cheese into mixture. Add more olive oil if you need to and pulse again, repeating until you have the consistency that you want; the pesto should be thick, but just barely ‘pourable’. Adjust for seasoning. The original cheese for making pesto genovese is an ancient pecorino from Sardinia called Fiore Sardo. (Back in the day, Sardinia belonged the Republic of Genoa.) It can be hard to find, although it is available at some fine cheese shops like Murray’s in New York. I usually substitute the ubiquitous pecorino romano, which is a tad sharper. The ratio of parmesan to pecorino varies from recipe to recipe, with some calling for Parmesan only, which I personally find just too mild to stand up to the assertive flavor of the garlic and basil. A true pesto is made with a particular kind of basil that grows around Genoa called basilico di Prà. They say that the small leaves of the young plant produce a uniquely fine flavor, one reason why you really can’t make a truly authentic pesto elsewhere. The classic pastas for pesto are trenette and trofie. Trenette are somewhat like linguine but rather plumper, and hard to find stateside. Linguine are a fine substitute (and often used even in Italy outside Liguria). Trofie are another typical homemade Genovese pasta, rather short. slender and twisted, not too different from the easier to find strozzapreti, which you can use as a substitute. Pesto is also marvelous on potato gnocchi and mixed into the Ligurian version of minestrone. 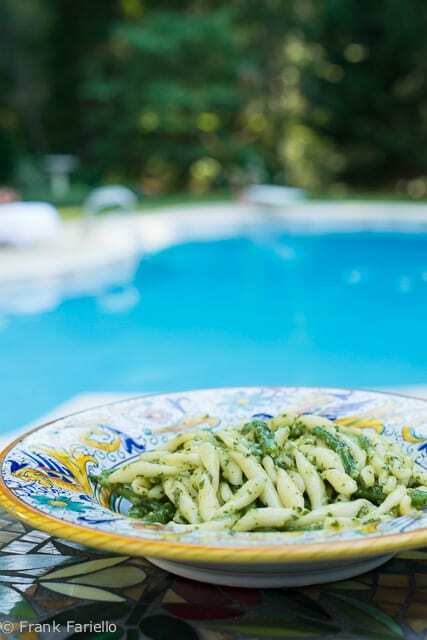 Pasta with pesto often includes some green beans and thinly sliced potatoes, which are cooked along with the pasta in salted water and then mixed well with the pesto before serving. If you haven’t tried pesto this way, do yourself a favor—it’s a fabulous combination. You can top it with additional grated cheese if you like. If you want to make pesto the old fashioned way (and purists will tell you that real pesto can only be made this way), break out your mortar and pestle. (The word pesto, in fact, used to mean pestle in Italian, although it’s now called pestello in modern Italian. And mortar is mortaio, in case you’re interested.) In any event, start with your garlic and a pinch of salt and starting mashing the garlic. When it’s a paste, add the pinoli, mash them, to a paste then start adding the basil leaves, little by little, crushing them into a paste before adding the next handful, adding oil as you go. Then add your cheese and test for seasoning. It’s a lot of effort and, to my plebeian tastes at least, not really worth it. But do try it once just to know what a hand-made pesto is like. While pesto genovese is fairly easy to make, it is tempting to make it in bulk and save it. The basil does tend to discolor, however, so top it up with a bit of olive oil if you plan to keep it in the fridge. And don’t wait too long to use it, as garlic tends to become unpleasantly strong over time. In the alternative, I understand that pesto freezes well, although I can’t say I’ve tried it myself. In the age of food processors, pesto is simplicity itself to make. You throw in the garlic cloves and pulse a few times, until the garlic is minced fairly well. Then add the basil, a handful of pinoli, salt and a generous amount of olive oil. Whiz that around (always using the pulse button) until you have a rough paste. Don't over-process. Pesto should have texture, with each element still perceptible to the eye and tongue. Then add the grated cheeses. Pulse again, just enough to blend the cheese into mixture. Add more olive oil if you need to and pulse again, repeating until you have the consistency that you want; the pesto should be thick, but just barely 'pourable'. Adjust for seasoning. In Liguria people will vary the amount of garlic in pesto. With less garlic its considered more ‘dolce’. In California (near SF ) we can find fresh basil Genovese that’s actually very good and quite fragrant. Sometimes we use walnuts instead of pine nuts as its hard to find good quality pine nuts from Italy in most markets. Lastly, Liguria is known for olive oil made from Taggiasca olives but that’s really hard to find in the US. It does indeed freeze well. Your father makes great pesto?. Dad (probably mom) puts it really little containers and freezes it. I have also known people to put the pesto in ice cube trays and when it’s frozen put the cubes in a freezer bag. Thank you for the post. I love the pesto basil sauce when I tasted it in Genoa and since then I have been craving on making one for myself. Thanks for your comment, Melche, and enjoy! Love pesto! I have to say my favorite version though is with very little garlic: i know is not authentic, but it makes it a bit lighter! We also make lasagne with pesto a lot, although my favorite way is with pasta and green beans and potatoes. un sugo estivo che piace a tutti, nell’attesa che l’estate, almeno dalle mia parti, arrivi finalmente ! Buona settimana Frank ! You said that the pesto should be redolent of garlic…We have a saying in our family…”you can’t have too much garlic!” We have proved this to be incorrect a few times. I preserve it two ways. First, chopped in the food processor, with olive oil, put into containers and topped with olive oil to create a barrier and freeze.I use this mostly on pasta. To use, place desired amount in a bowl and add garlic and cheese. Be sure to clean the sides of the container and float more oil oil on top. Secondly,blanch the leave in boiling water for thirty serconds. Then place in a salad spinner, to remove most of the water, and squeeze by hand to remove even more water. Press in the palm of your hand, forming it into a cylinder shape. Wrap in plastic wrap first, then foil, I use it in soup, shaving it with a sharp knife, while still frozen, or defrost and give it a rough chop. This is how we make our pesto, lots of fresh from the garden basil and the best ingredients we can afford. We, too freeze some for winter or for bringing along on a camping trip. Yum. Thanks for reminding me of good times. And thank you for stopping by, Susanna! I love this post. I wish I could have the proper basil in order to make pesto, but nonetheless, my pesto is pretty darn good. I have enjoyed a white lasagne with pesto in Cinque Terre – I even watched the pesto being made – and it was so fragrant. This summer I planted Genovese basil, at least that’s what it was called when I ordered itt online, and although it had a different fragrance, I couldn’t tell the difference in the pesto. Oh well!